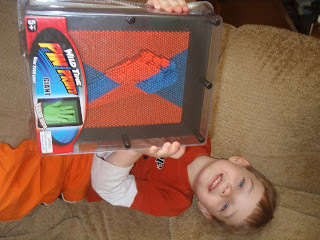 Image: My youngest son, C2, demonstrates one way to play with the Wild Time Pin Print Toy by Blip Toys. He received this toy from a friend for his 6th birthday in January. The possibilities are numerous. We made inprints of small stuffed animals too. My whole family, including me, wanted to play with this one! It can be purchased through Amazon.com for U.S. $7.49 (as of 3/1/09) and is also available in a yellow/purple.